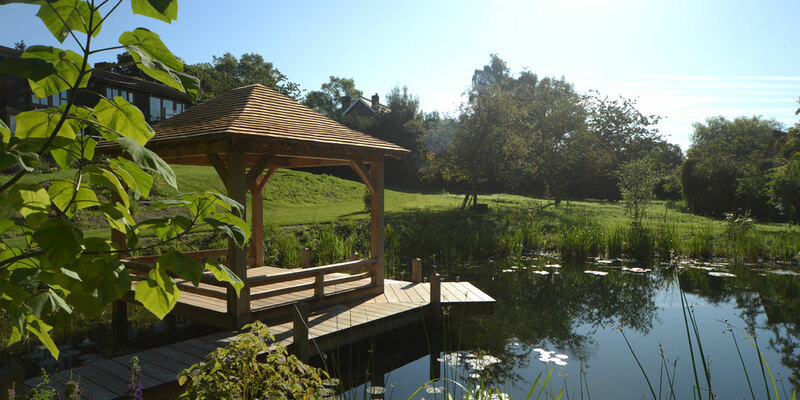 Our second project in this Hertfordshire village. 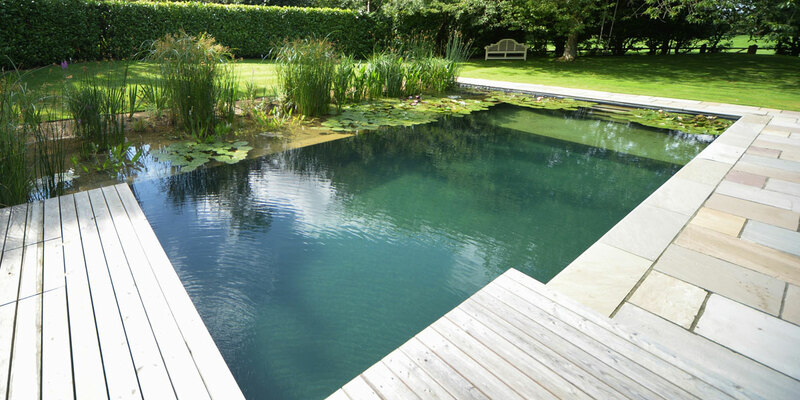 We were asked to convert an existing concrete pool that was not being used anymore for swimming. 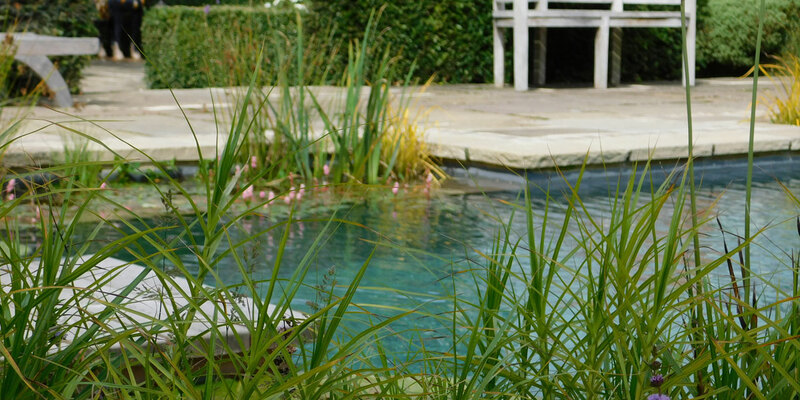 The brief was to create a strong visual centre-piece for the garden which could be admired as a water feature and used occasionally for a refreshing dip. This pool conversion project was completed in 2017. 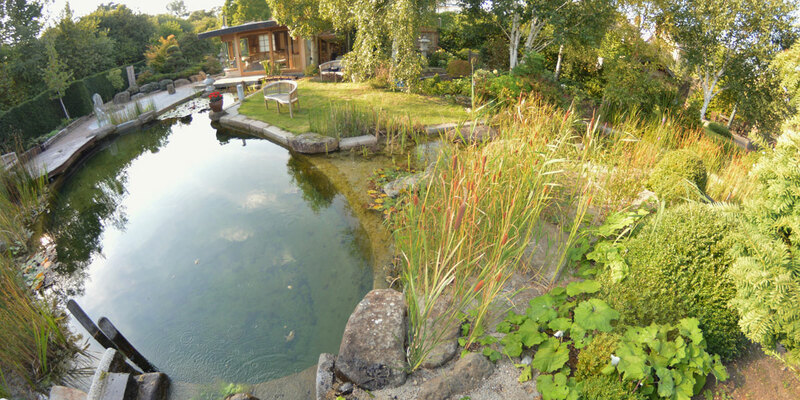 We were asked to transform a redundant concrete pool into a eye-catching water feature and wildlife haven. 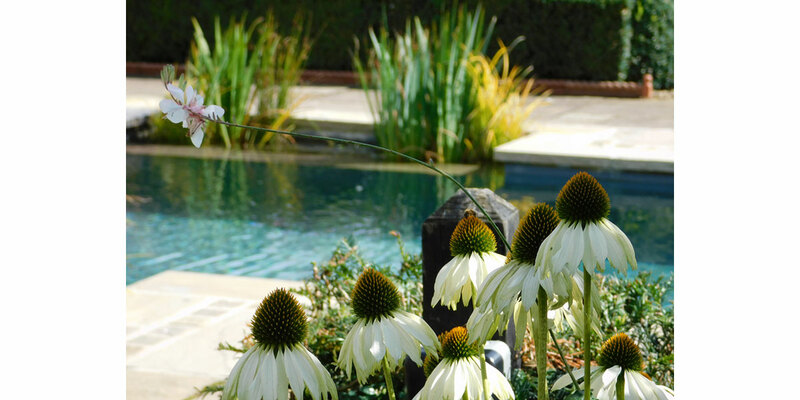 The owner was a passionate gardener who took a keen interest in all the planting and was thrilled with the final result. 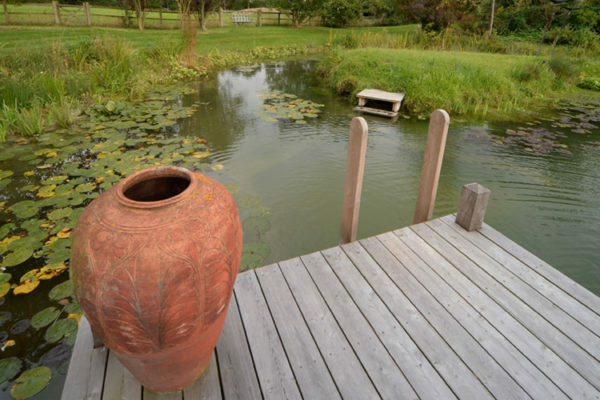 Originally a clay dew pond 350sqm, this was excavated and converted using the existing clay on site to seal and raise the level to a 650sqm pond for swimming in. The cost for this is about half that of building lined swimming pools. A giant skimmer and a limestone filter and underwater grass are starting already to make a clear impact in its first season. The wooden jetty and island sit on piles driven straight into the clay. When it rains it is topped up from a pump fitted in a drainage ditch sump. This works extremely well and there have been no problems with water levels or algae with this method. It is pure and clear like a chalk stream. 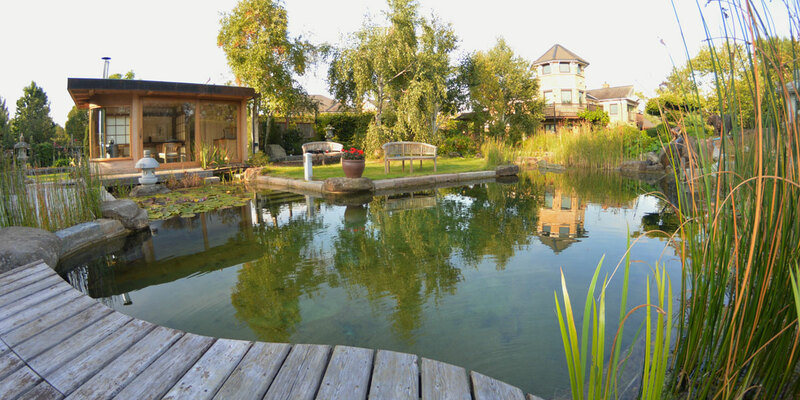 When we went to first see the clients they asked us ‘what sort of guarantee could we give that this new type of pond pool would work?’ We said ‘we absolutely guarantee that that our pond would make them very happy indeed’…..which it did! 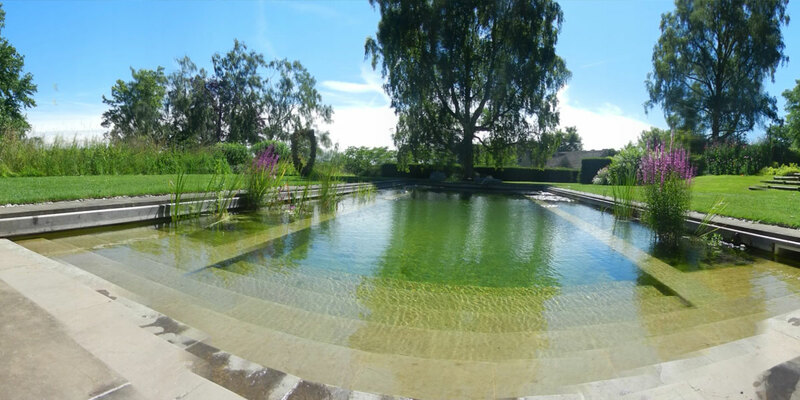 Our latest pool was the conversion of an older natural swimming pool to a pure living pool . The pool had been built by others, but to a poor standard with too small a plant filter and little guidance or support or maintenance . 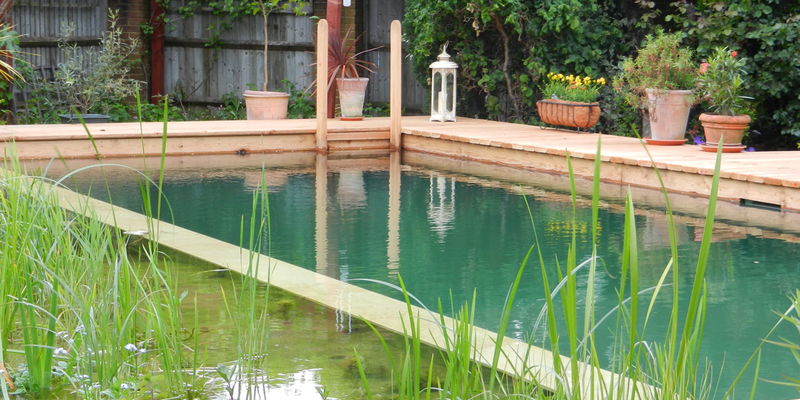 Rather than uprade the natural filtration our client opted for a totally natural chemical-free Pure Living Pool. Now virtually maintenance-free . Note the robot in the pool. This comes on automatically each day for a week at atime before emptying. 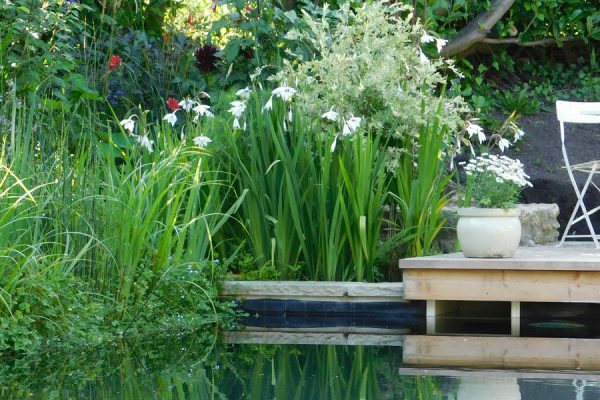 The pool is small and has minimal costs to run; electricity of about £50 per year and every two years replacement filter media of £500. Heating is free. It is fitted with a solar heating cover. This gives temperatures 4-8c above maximum day time tempertures. Which means when it is 14-15c outside in October you can still be swimming in a pool that is above 20c without a horrendous fuel bill. Who would have thought that was possible? A delightful Living Pool constructed in the summer of 2015. 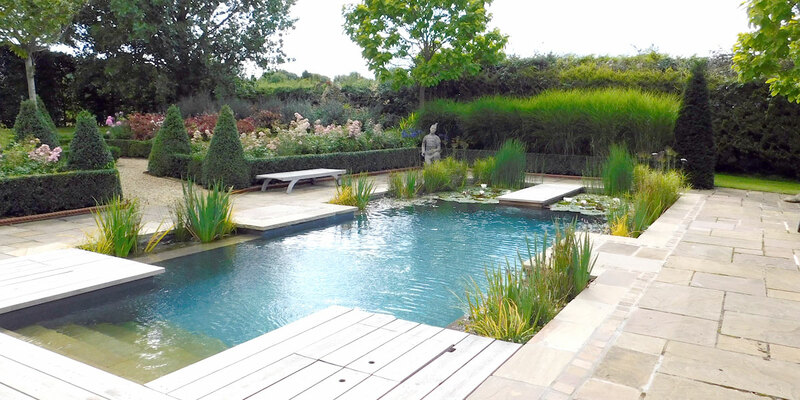 The existing swimming pool was relined with a black liner to mirror the enclosed garden and trees. 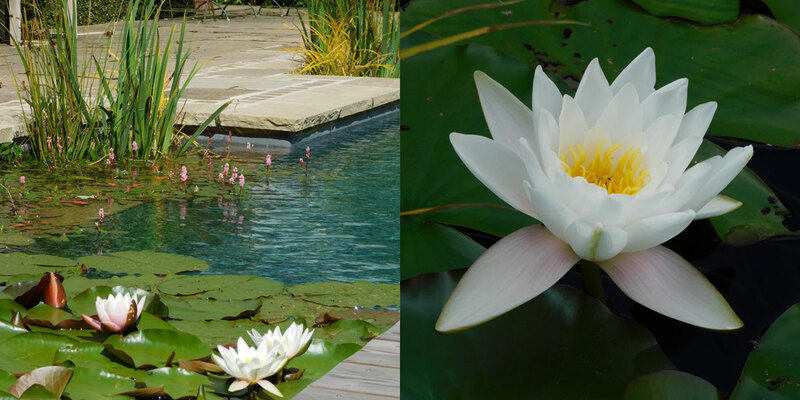 Lily beds either side of the steps into the pool create an enticing entrance. 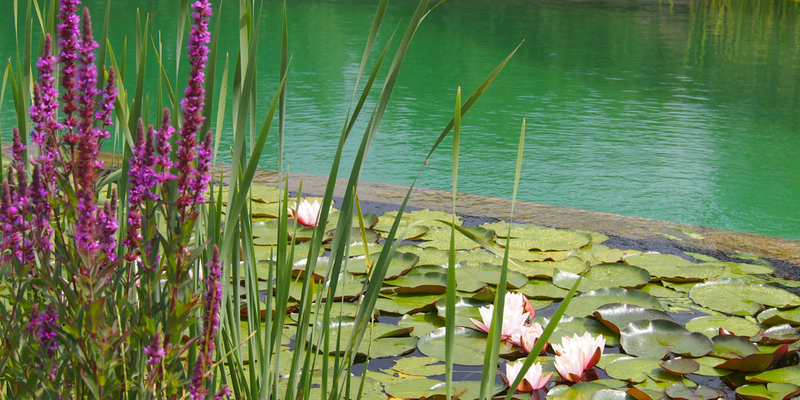 The lilies are prolific as they are fed extra food pellets (they do not get the nutrients they need just from the water). Simple design working at its best. 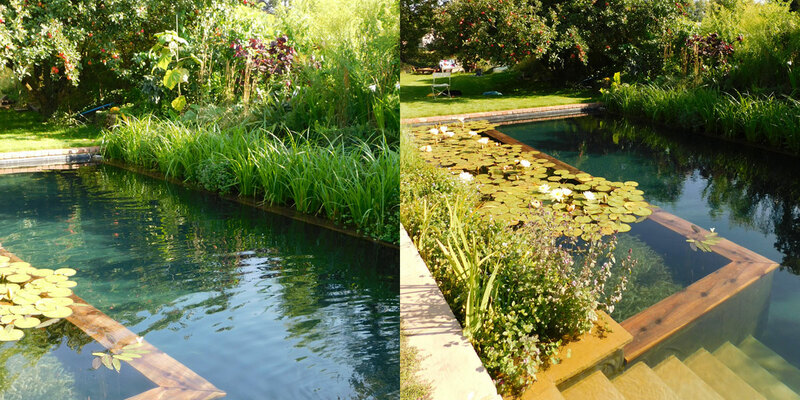 In 2014 we were asked to convert an existing ‘pea soup’ pond covered with duck weed. Although it had a spring that kept it full it was in a stagnant and lifeless condition. The brief was also to build jetties and a hut to lounge in, and if possible deep clear conditions for diving into and swimming. We created our own skimming and mineral bed filter system that could cope with larger variations in water level and sufficient shelf areas for filter planting. 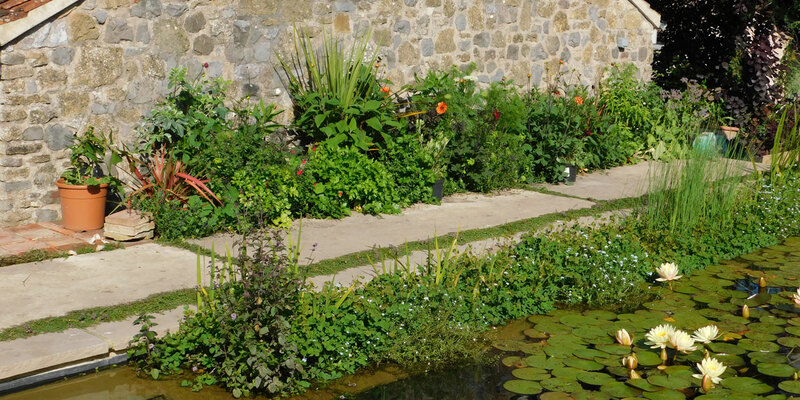 We also drained and diverted away surface and gutter water that flowed in. The spring was piped and valved to provide a controllable top system. The pool remained cloudy for a month mainly due to its popularity for swimming, but then a mini miracle occurred. it cleared beyond anyone’s expectation right down to the bottom – at 5m at its deepest point this may be one of the clearest ponds in the UK. A filter bed stream runs from a under a false brick and grass bridge to jetties and out over stepped shallow areas into a wide rounded pond. A pure living pool. 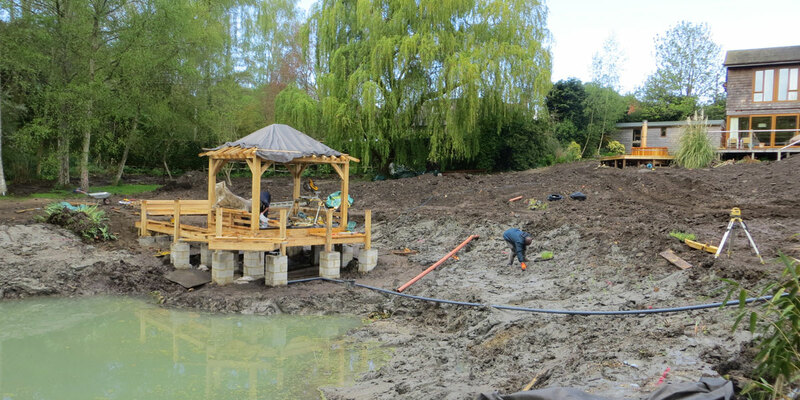 The first of these pictures were taken when the pool was completed and the clay filter bed had been stirred up (although it is safe to swim from day one). After two weeks the pool was crystal clear as seen in the last six pictures. 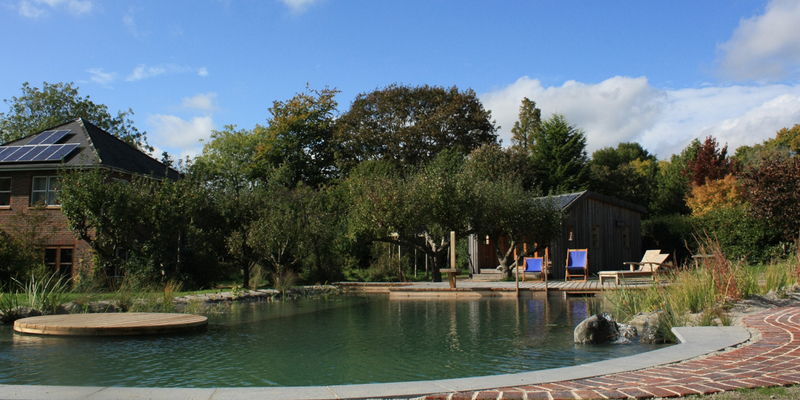 A large natural pool made with a snaking shape. A deck causeway looks like it is separating marsh planting from the pool but this is an illusion as the filterplants are just down one side. 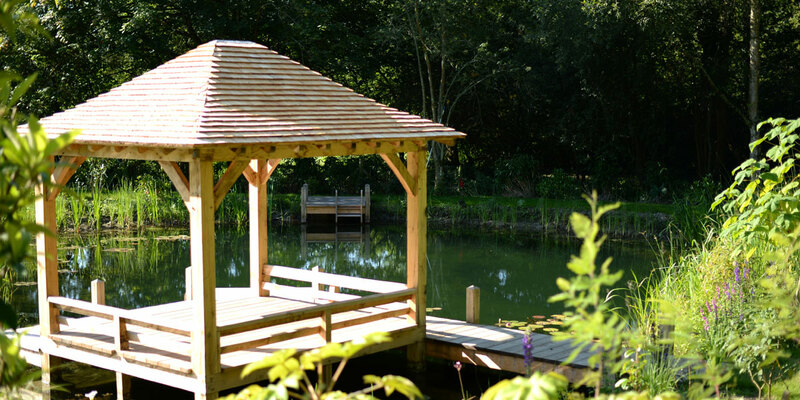 The gazebo as with most of the buildings by our pools was designed, supplied and built by us. 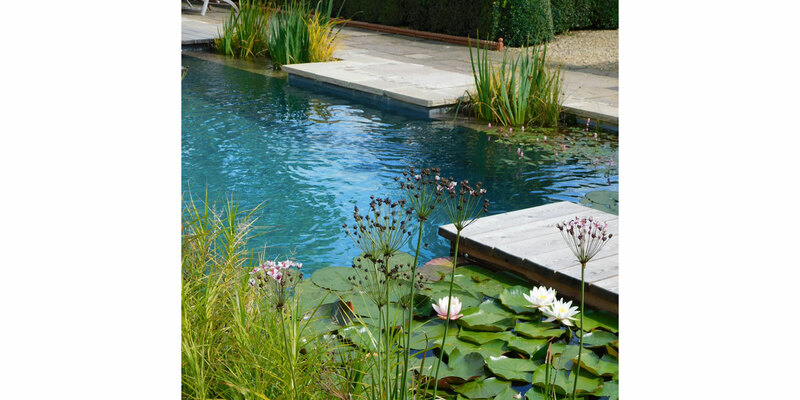 The formal pool conversion and enlargement transformed the space into a refreshing new water and flower garden with an arts and craft feel. Vilalte is an ancient monastery situated at a height of 1500m on Mount Canigou in the Pyrenees. 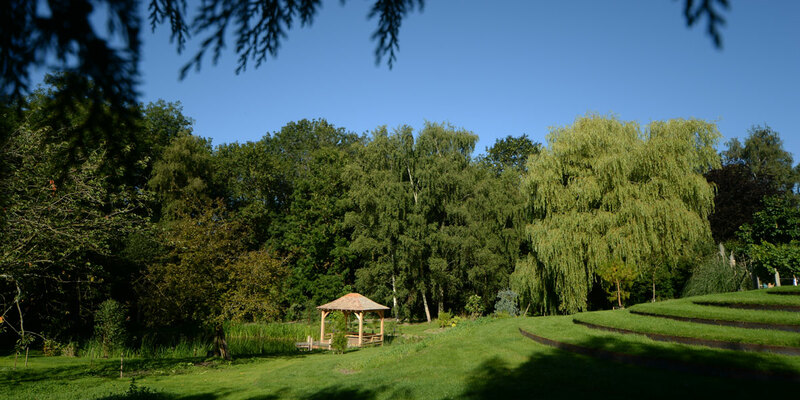 It is being developed as a musical retreat and place of teaching. 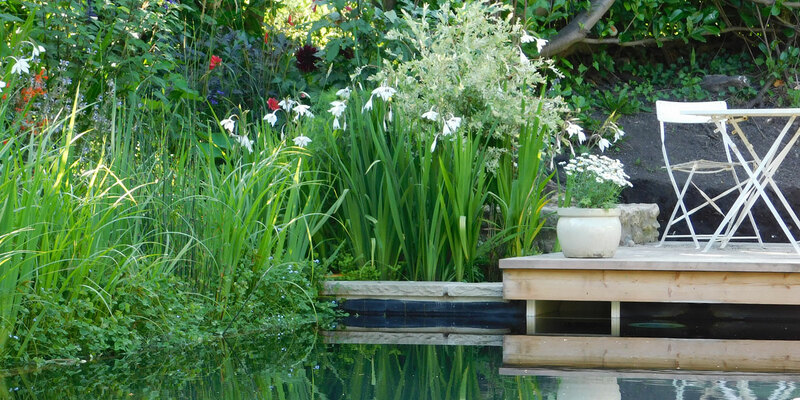 This planted living pool has foam filters under the infinite edge, clay lily and oxygenator beds and open plant reed filters. 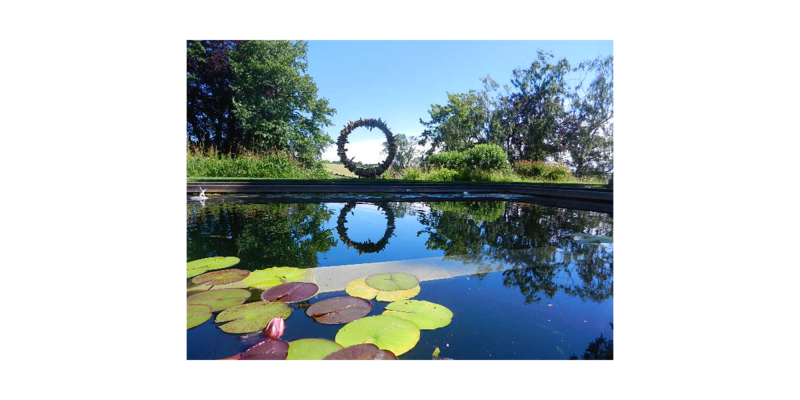 Water is also cleaned with a flow form water sculpture through circular and pulsing motions. 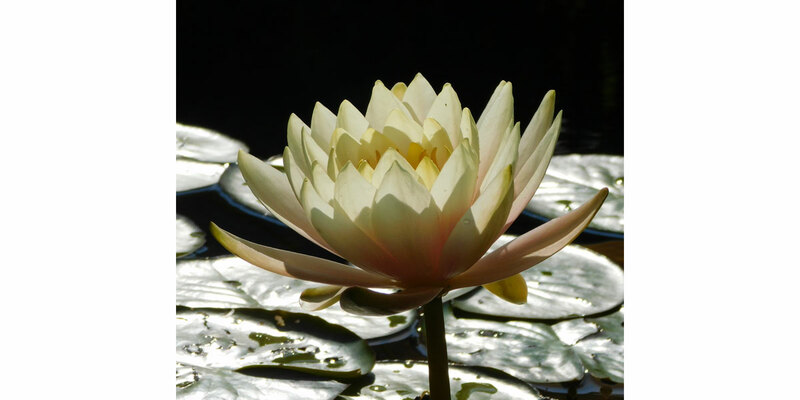 These are known to balance the elements within water, enhance plant growth and promote health in the water. 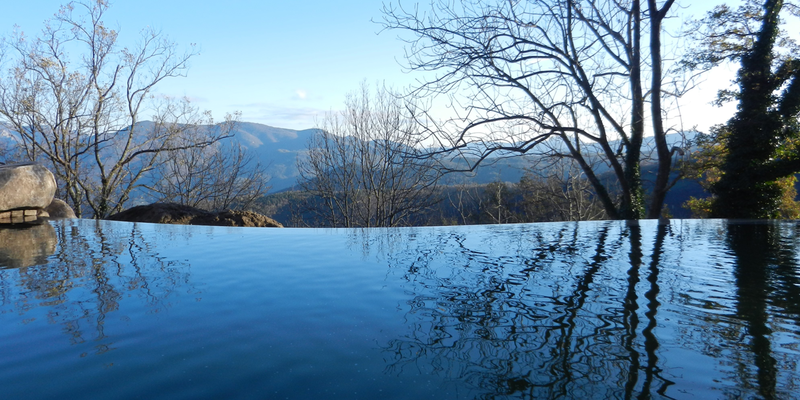 It is hoped this pool will become a focus of inspiration and pure living as it starts to grow and breath new life into what was before a dry rocky mountainside. With 400m3 of water it could have at 40 swimmers in it all of the time and maintain clean water through the day. 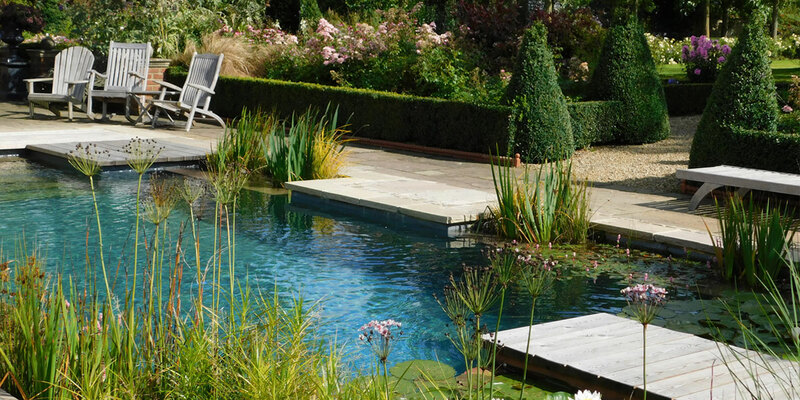 Our first natural pool using the new living pool filter 5 years ago enabled a clean, modern swimming pool look. 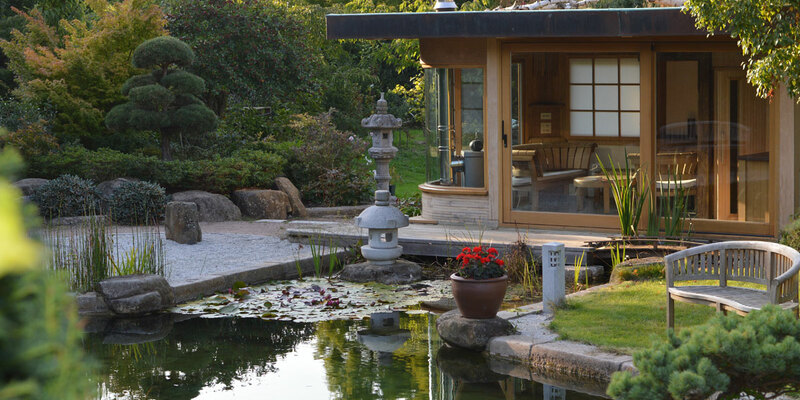 We added some dynamism with a causeway to divide the garden and pool space, glass bridge , water falls and deck surrounded by water on three sides . 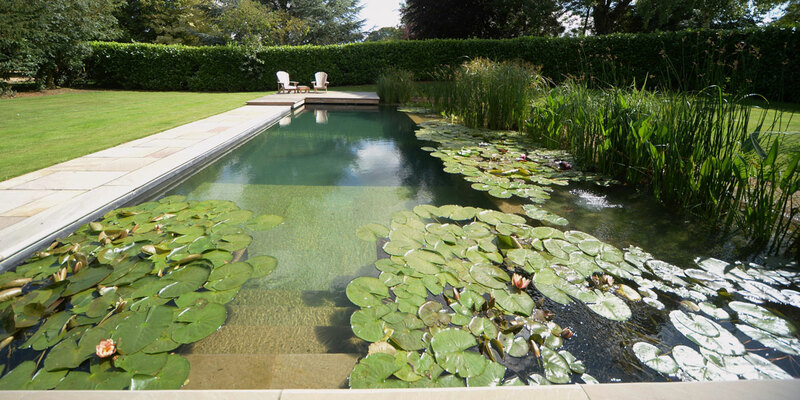 Our first plant free pure-living pool in the UK has worked well with a solar heating cover. At at the end of September 2014 it was 24C, way beyond expectations of the owner and paying guests. It is 23m long to match the adjacent barn 3.5metres wide and 1.5metres deep with a jet black liner and Cornish Delabole slate steps and surround. 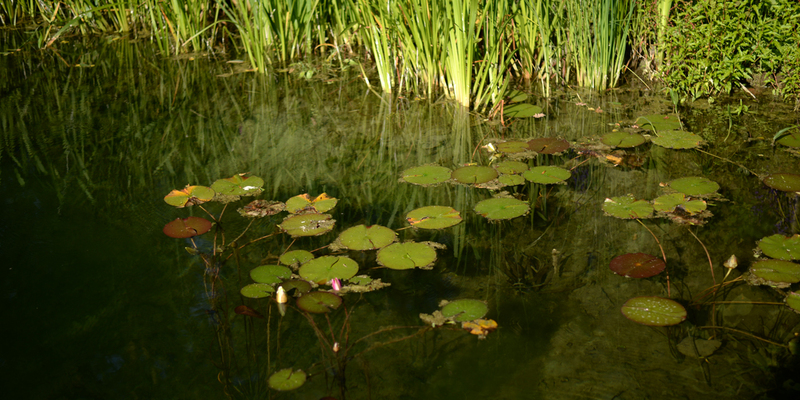 This swimming pond takes water from a spring close by which has created huge plant growth without infringing on a deep swimming hole. Providing the plants are cut back every year and cleaned and thinned every 5 years, it will remain the same, as if it has always been there. 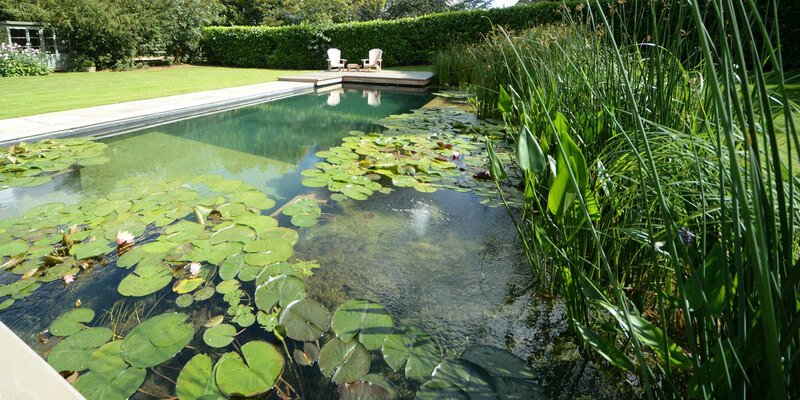 An earth-dug pool designed to show off large water lilies and to look like it is sitting in a larger natural wetland with the use of special giant grasses. 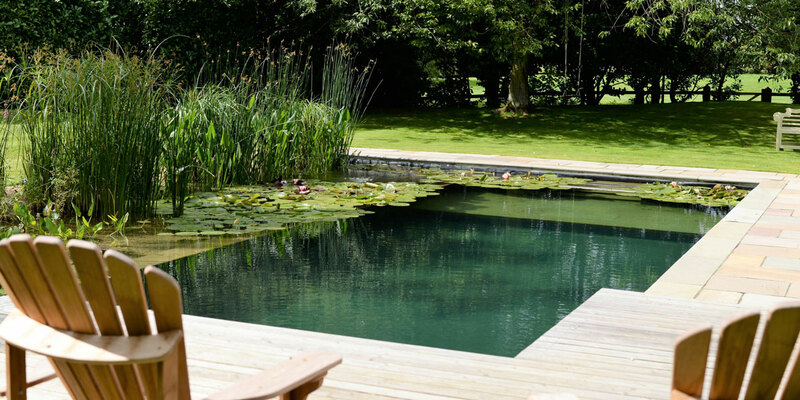 This pool on the south coast is just back from the beach, sunken and sheltering behind an old watch house which was converted into a contemporary home. The biological filter was left open and planted. A light grey lining gives a more natural aqua marine colour. 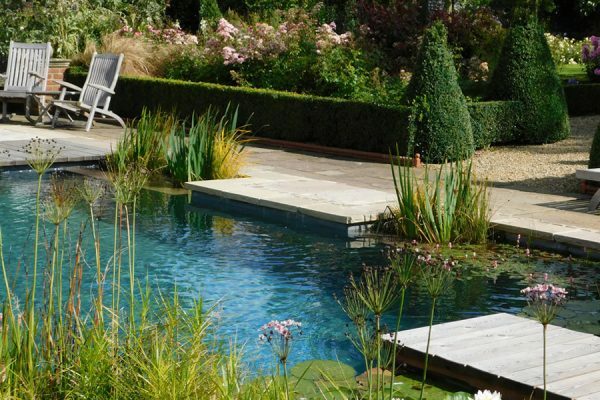 Covered by a gardening magazine and on the front cover of a natural swimming pool book, this pool is one of our favourites. 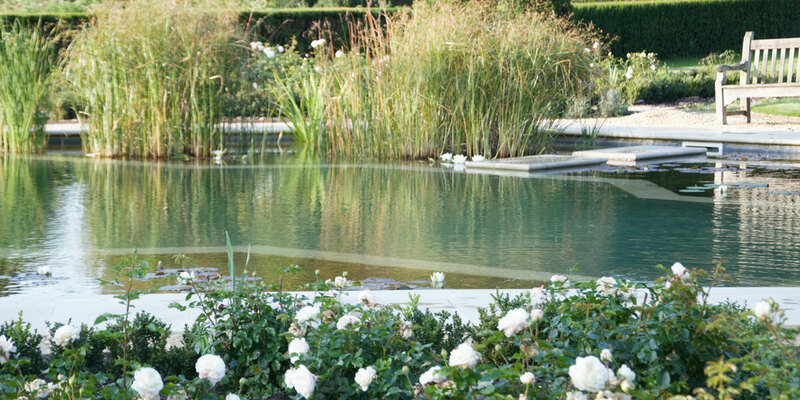 Small geometric designs always work well, however informal the setting. This small swimming lake was built in record time of 6 weeks by half digging and half raising the ground. 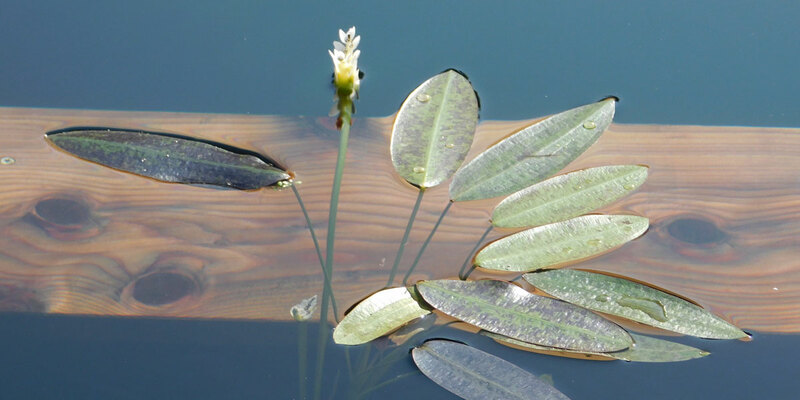 The body of calm water and planting has brought a new serenity to what was an open and inhospitably cold site in the forest. The equipment,construction and planting depths were designed specially to cope with to -30C in winter. It is much used in temperatures of +30C in the summer as soon as up to a metre of ice has melted. 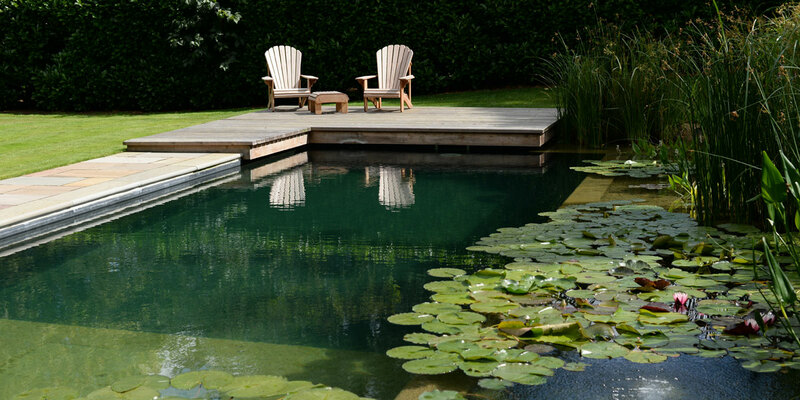 A natural pool with a few fun features; a floating wood island, diving board and bubbling fountain . A mid grey liner just in the shallow area gives a deep green /blue hue and the depth can be judged by eye by those diving in. In the deep area, a black lining creates reflections of the South Downs on the surface . The owner a doctor swims every day of the year. It must be good for you. 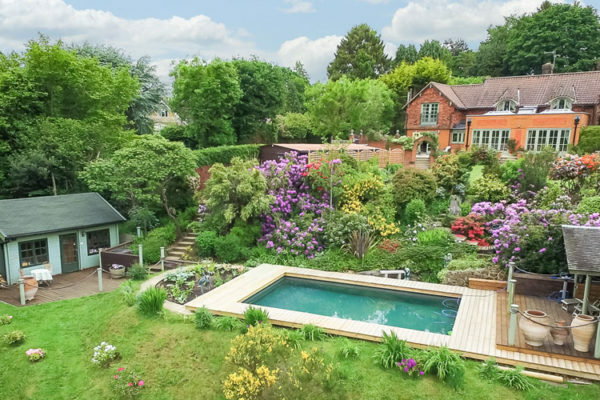 Many pools we build are small and not dissimilar to fit into town gardens and smaller plots This is just one of them that was particularly challenging to do without damaging trees and shrubs. 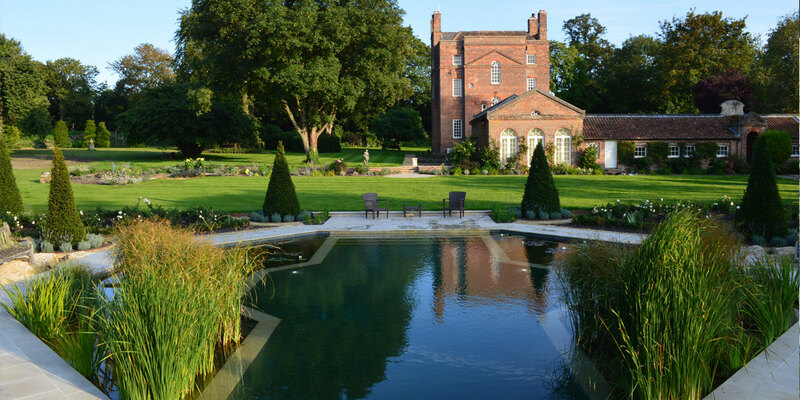 A classical octagonal pool pure- living pool with materials in keeping with the grounds of a grade 1* listed house. 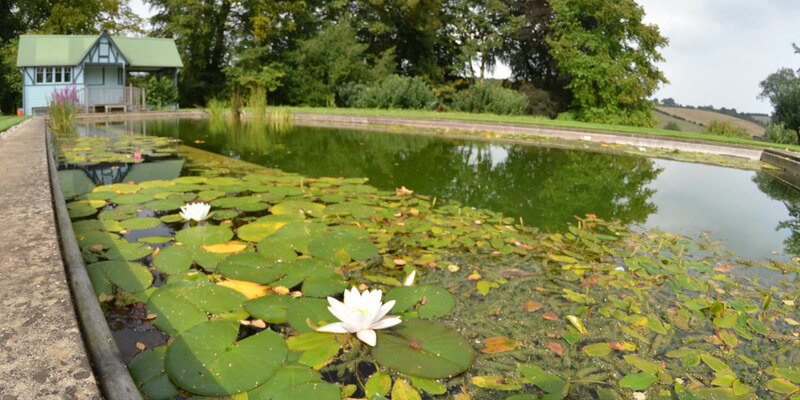 A new of mineral material filtration was used to stimulate plant growth whilst helping maintain the sharpest water clarity possible . 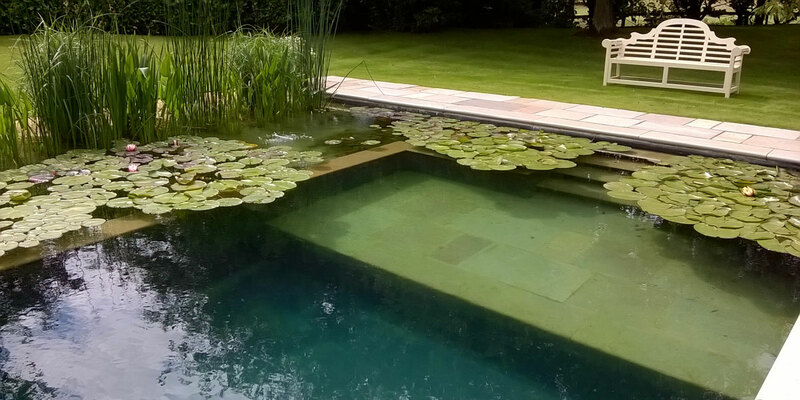 A traditional formal design successfully hides its use as a swimming pool. The Italianate frame-work enhances this setting. 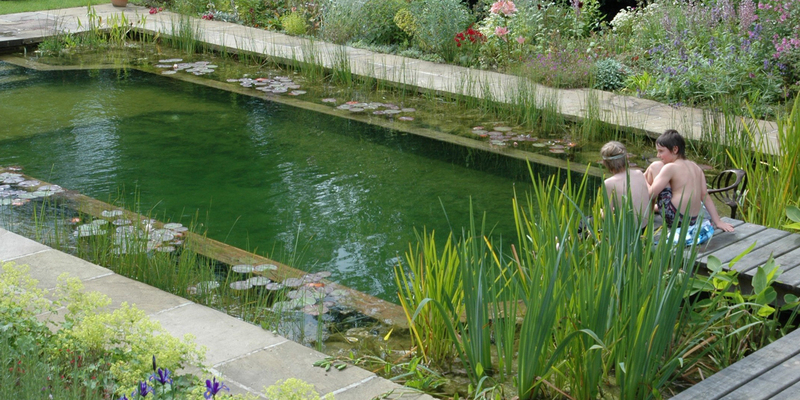 The pool at Asthall, Oxfordshire is in a garden and house open for art and sculpture.The design was for a simple clear water canal lined with lillies and deep oxygenating plants either side, converted from within the walls of an existing large swimming pool. It provides a reflective surface for pieces displayed at its side and small floating installations within it. As featured in the ‘On Form’ sculpture show in 2014.